Could This Be the Least Volatile September Ever? September has been dull, but would you believe it is on pace to be the least volatile September ever? We feel like a broken record here, but 2017 continues to look more and more like the mid-‘60s and mid-‘90s— the two periods that rank as the least volatile in history. 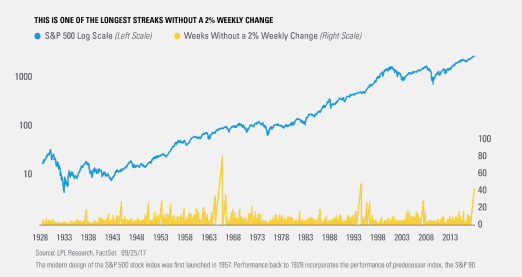 For example, as of last week, the S&P 500 Index went 41 consecutive weeks without a weekly move greater than 2% in either direction. Only the mid-‘60s and mid-‘90s have seen longer streaks. But here’s where things get interesting; the average daily range so far this month has been only 0.39%, which is by far the smallest daily range during September ever (according to reliable single-day data going back to 1970). Of course, there is still time left in the month, but it appears that September will close as one of (if not the) least volatile Septembers ever. But what does it all mean? As we laid out in our latest Weekly Market Commentary, we fully expect to see volatility turn higher in the fourth quarter. Per Ryan Detrick, Senior Market Strategist, “One reason to expect a good dose of volatility is because, in addition to its shorter days, changing leaves, hayrides, and of course Halloween, October is known for being the most volatile month of the year.” In fact, since 1970, no month has had more 1% changes (higher or lower), as nearly 30% of all days closed up or down at least 1%.